Fitness fads and crazes come and go but every now and then a new workout format arrives that endures. 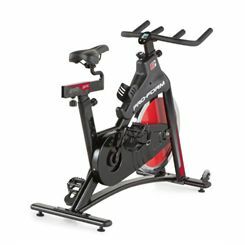 Indoor cycling is one such class - it has grown from a personal project in a garage to a worldwide phenomenon attracting millions of people to participate; some in group classes at gyms and a growing number at home. In the early 1990s Johnny Goldberg was working as a personal trainer and competing as an endurance cyclist. He wanted a way to continue to train when the California sun wasn’t shining and so he developed an indoor cycle that closely replicated road racing. After a period of training on it he set a record when he biked 544miles non-stop through Arizona in 29hours and 46 minutes. Eager to share the benefits he opened an indoor cycling centre in Santa Monica and ran classes there and Spinning™ was born. 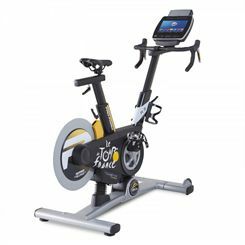 Since then the bikes are a must-have for road cyclists keen to improve their performance while the classes has attracted a growing number of general fitness fanatics eager to tone up, burn calories and build their fitness. 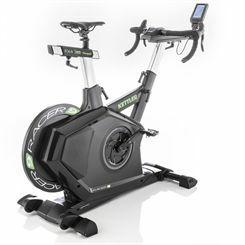 Indoor cycling is now a global phenomenon, loved by cycle and fitness enthusiasts alike, and with numerous branded classes it’s available in virtually every gym worldwide. 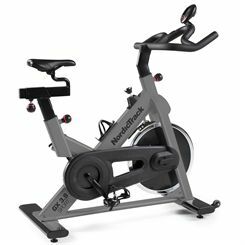 Indoor cycling offers a great low-impact cardio workout for all ages and all levels of fitness. The duration, intensity, speed and resistance can all be altered to suit the abilities of the exerciser and the goals they’ve set. 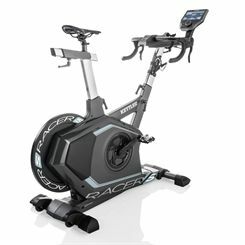 The idea behind indoor cycling is to replicate the on-road experience and so when using the bike you should alternate between periods of high resistance and low RPM, as if you’re going uphill and low resistance and high RPM, as if you’re going downhill. Doing so has a number of benefits; you’ll train you heart harder and improve its recovery time just as you do during circuit training. You’ll also get the benefits of High Intensity Training (HIT) too – which improves your endurance and builds your cardio-vascular system. Little wonder then that athletes from all manner of sports include indoor cycling in their training regimes. If you’re aiming to lose weight you can burn roughly 400-600 calories in 40 minutes depending on your level of exertion. Compared to running it’s roughly the same even though it’s not weight-bearing, which demonstrates how much harder the legs work. 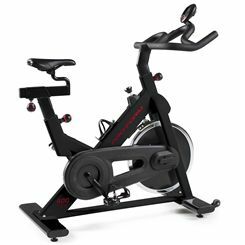 If you want to tone your legs indoor cycling is perfect because the traditional cycling action requires every leg muscle to complete a revolution. With indoor cycles don’t just have to ride in the seat. You can stand and cycle with the fingertips lightly rested on the handlebars and you can lean on the handle bars with the glutes elevated to access different leg and some core muscles. You can also vary the action of the leg between pushing down on the pedal to tone the quads and pulling the pedal back to tone the glutes and hamstrings. And if you want to train for an event it’s an all-weather, every day option that you can fit in to your day and your home, with some models being relatively compact. 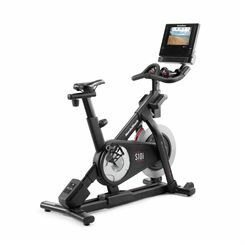 Most indoor bikes come with pre-loaded programmes, others allow you to enter programmes of your own and there is a wealth of virtual indoor cycle classes available on apps and online to keep you challenged and motivated. 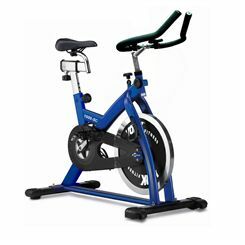 Indoor bikes can also help those need of physiotherapy and injury recovery. In the seated position with adequate resistance the knee remains aligned with the hip as you cycle and since there’s no impact on the joints they are stabilised and strengthened. Of course if you’re using one for this purpose always consult a health professional for detailed guidance. 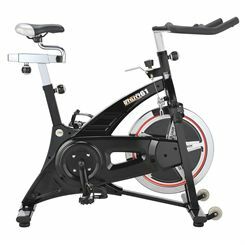 Indoor cycles are upright bikes that feature adjustable resistance, which is controlled by a dial on the handlebars. The bike seat can be adjusted horizontally and vertically to suit the rider and the height of the drop handlebars can also be adjusted for optimal comfort and performance. There are usually a couple of transportation wheels at the bottom of the front of the bike so it can be tilted and transported easily, they’re useful because the flywheel on an indoor cycle can be very heavy. The stablilisers at the bottom of the frame have adjustable feet to allow a horizontal position of the bike on what can be an uneven surface in the home. They’re rubber too and so they grip against the floor and protect it from damage. The pedals usually feature foot clips to hold the foot in place. 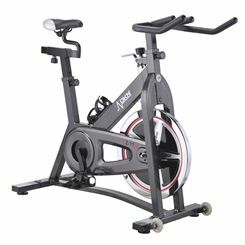 The flywheel of an indoor cycle operates in much the same way as the front wheel of an outdoor bike. 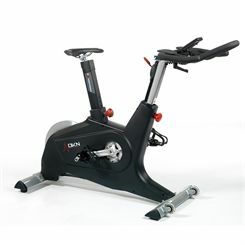 The exerciser pedals to move the mechanism behind which in turn causes the flywheel to store energy. 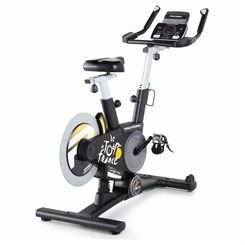 Flywheels on indoor bikes vary in weight from 44kg to 120kg at the heavier end. Heavier flywheels mean more resistance from the outset. They deliver a smoother ride, albeit a tougher one! 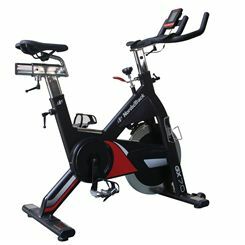 Variable resistance is achieved on different indoor bikes in different ways. The simplest and cheapest indoor bikes will use a tension belt to alter resistance. Adjustment on these is usually manual and on lower range models the belt will stretch and eventually give over time. Air pressure resistance is more sophisticated and durable. 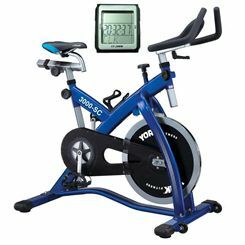 Consoles or automated programs adjust the resistance on these types of indoor cycles. The tension results from air pressure created by a fan blade. Contact resistance works much like the brake pad of an outdoor cycle by simply applying pressure to the flywheel. And, like brake pads, they’re subject to wear and tear. 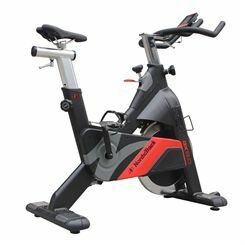 Magnetic resistance indoor bikes use electromagnetic induction. The result is smooth, consistent resistance all at the touch of a button. This type of resistance is the quietest, the most accurate, the most durable and of course, the most expensive. If you work hard on your bike you’re going to perspire a fair deal and since sweat is corrosive you need to wipe your bike thoroughly every time you use it. Use a non-abrasive cloth and preferably a natural product cleaner for the seat, frame, handle bar and chain guard. On a regular basis get on the bike and pedal, if you feel lots of vibrations the pedals may need tightening or the chain tension may need adjusting. Your manual will show you how to do this, and it’s an easy job which will promote the longevity and performance of your indoor bike. Once a week you should inspect all moving parts and tighten as necessary like the pull pin mechanisms for saddle and handlebar adjustment. These will also benefit from a weekly spray of lubricant along with the resistance pads (if applicable). Getting the seat height right when you ride is important, equally so is having a level and centred seat so re-align the saddle if it’s off centre. Every month conduct a more in-depth inspection of every nut and bolt, tightening where needed to make the bike secure. Lubricate the chain too, and use a purpose-made chain lubricant as other, more general lubes don’t work as well. To do so remove the cover, turn the pedals to move the chain and spray it lightly as it travels. The seat post, handle bar post and seat slider should all be cleaned and lubricated on a monthly basis. And remember most bikes come with mechanical parts guarantees so check the terms of the guarantees before you do anything else as you may lose your rights if you go much further. And in the case of mechanical or electronic malfunctions always consult the manufacturer in the first instance.